We can live without food for a month. We can live without air in our lungs for just minutes. Hydration is the second most important substance required by the human body for life. If water is so important, should it not be pure H2O? And, would water that is the correct pH, filled with natural antioxidants and structured for maximum absorbtion be better than water that went from flush to faucet? It’s true, the water that comes out of our faucet was flushed down someone’s toilet, washed clothes, or went down the drain in a bath or shower. Water is collected by big cities and treated with large amounts of chemicals and then goes through pipes filled with scum on the way to our homes. We then cook with it, make tea or coffee, or drink it. If you are not sure if these statements are correct, watch this news program. 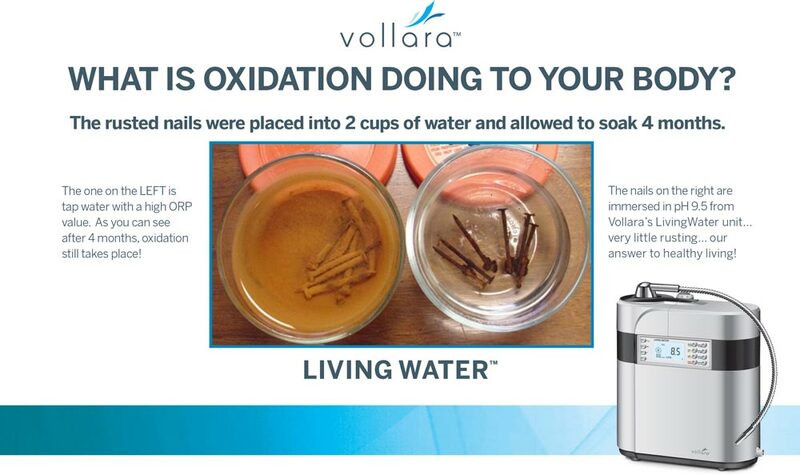 LivingWater from Vollara comes from a system you hook up in your kitchen that provides unlimited amounts of clean fresh pH-adjusted water at the best value possible. LivingWater is high in antioxidants and provides the lowest and healthiest ORP. Low ORP can be thought of as anti-aging or anti-corrosive. As an example, if you take a handful of new nails and put them into two jars and then fill one jar with bottled or tap water and the other with LivingWater, in a few months the nails in the bottled or tap water jar will be rusty while the nails in the Living Water will not be rusty! Living Water is rich in hydrogen. The writer of this blog had a major heart attack and has an ejection fraction, or how much the heart pumps, of only 19%. Yet, my oxygen level in my blood is 100%. I can run up hills and steps. My cardiologist is baffled and says “Mike, I have patients with a 40% ejection fraction that can’t leave their couch. You at 19% are a miracle. I just keep telling him about Living Water! If Living Water works so well me for, imagine what it will do for a healthy person! You can order LivingWater from you independent Vollara business owner today! You will find this Health Hydration beverage of the future your number one enjoyed and consumed healthy drink today! If you would like free information brochures and a c/d, contact me at bestamer@aol.com and I will send for free if you cover postage.